Canadian auto plants might not be immune to lengthy summer shutdowns this year, some analysts warn. Manufacturers used to shut plants across North America for a week or two in July for maintenance and to keep inventories in check. As sales boomed on both sides of the border in recent years, most factories cranked out cars without a break. This summer, widespread closures may be back, and for weeks longer than before. The reason: four straight months of declining U.S. sales and little expectation the trend will reverse anytime soon. About 85 per cent of all vehicles built in Canada are shipped to the United States and that could spell trouble at home. 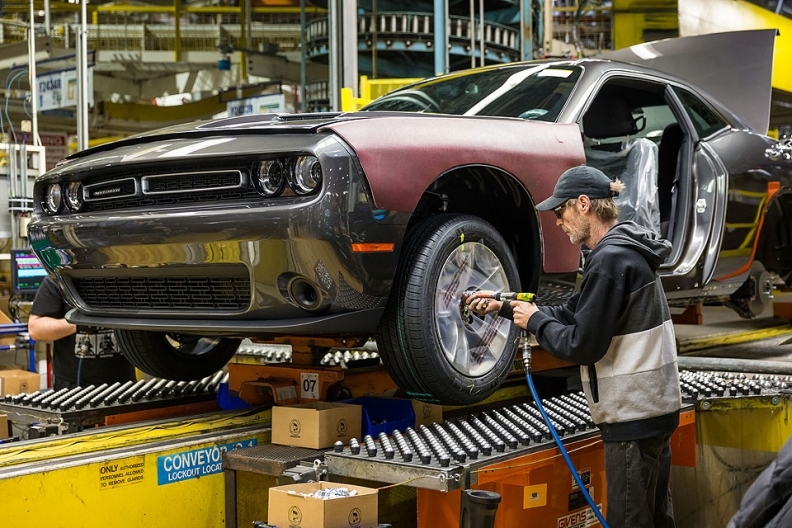 Many passenger cars are now made outside the United States — some of them in Canada — and that’s where the big cuts to output would probably take place, said Cornell University labor professor Art Wheaton. The Chrysler 300, Dodge Charger and Challenger, Honda Civic and Buick Regal, Cadillac XTS and Chevrolet Impala are all built in Ontario. Still, the reality is that automakers will likely aim to draw down bloated inventories by ratcheting back output. Last year, a record 17.6 million new vehicles sold in the United States. In April, the annualized pace was 16.9 million, the second month in a row that it came in under 17 million. The slow start to the year in the United States raised doubts about the idea that sales had just levelled off at close to historically high peaks. Corporate turnaround and restructuring facilitator AlixPartners forecasts they’ll fall by more than one million vehicles by 2019, down from its projected 17.25 million in 2017. It was a record year for sales in 2016 in Canada, too, as automakers sold 1.95 million vehicles. And while Canadian sales were up in each of the first three months of 2017, they slipped in April. None of the major automakers would discuss plans for factory intermissions this summer, saying it was too early to tell what closures might be necessary. But Erich Merkle, head of U.S. sales analysis at Ford, said that with the company’s inventories at 83 days, it may not need to add downtime if the market stays where it is. J.D. Power doesn’t track inventory but it does follow the number of days it takes to sell a car. At the end of the first quarter of 2017, that number stood at 71 in Canada. Karwel said that while they are two different metrics they are linked because generally, they both rise at the same time. “If it takes you longer to sell a car, you probably also have more days of inventory on hand,” he said. Weeks of production suspension seem almost certain to be on tap for the industry, said Mark Wakefield, managing director and head of the automotive practice at AlixPartners. He said automakers have aggressive plans for temporarily shuttering assemblies that make slow-selling sedans and small models. “For certain plants, we’ll see three or four summer shutdowns for the tougher-selling products,” Wakefield said. Right now, automakers “are a little less worried about inventories because they know they’ll be taking the plants down more,” he said. Greg Layson and Bloomberg News contributed to this report.